Prayer is a challenge for many of us. What should we ask of God? Is anyone listening? Why aren’t our prayers being answered? The hard truth is this: God doesn’t fulfill needs. For thousands of years, humanity has brought needs to God with little success, often resulting in disillusionment. 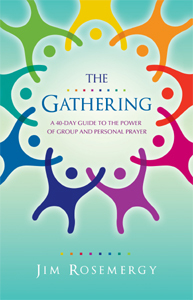 Now is the time to try something new: A nine-step prayer practice called The Gathering. The Gathering will lead you to the avenues through which God’s power and presence can be expressed. You’ll see that prayer isn’t something you do; rather, it’s an experience of God’s presence. Author Jim Rosemergy has seen thousands truly connect with God and transform their lives through prayer. The Gathering is divinely inspired. Whether practiced individually or within a group, in just 40 days, The Gathering will become your foundation for a genuine, ever-deepening experience of God’s immanent presence and unlimited power.